A couple of weeks ago, I had to put my old messenger bag down for the count and was looking for a new one. After visiting MicroCenter, I found one and didn't even realize I picked up a Solo-brand messenger bag (it didn't have a tag on it). 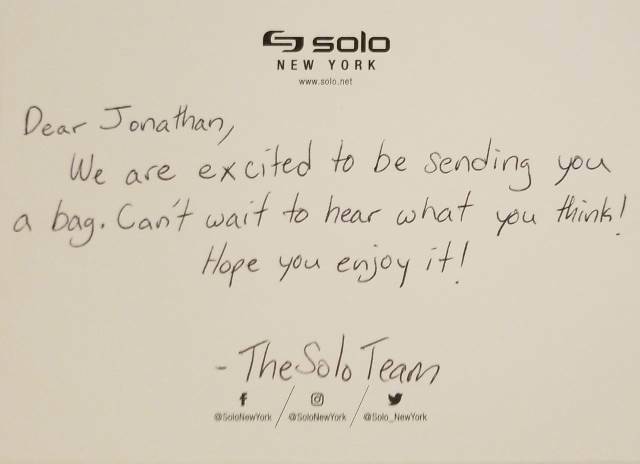 I decided to write a review of the Solo Urban Messenger Bag and it seems the Solo team from New York noticed the post. They sent me a new messenger bag called the Route Slim Brief from the Nomad collection. 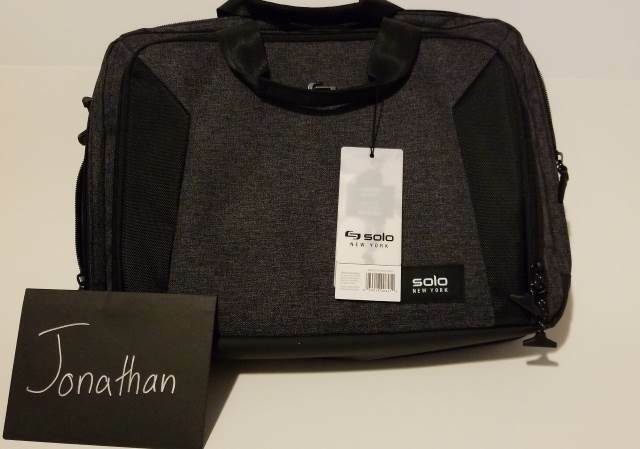 When I received it, I decided to put it through its paces by giving it a week or two "in the field" and provide a new review of the Solo's Route Messenger Bag (Sorry to say the orange Solo Urban is sitting in a corner of my room). After using this for ~9 days, I feel this is a better choice compared to the Solo Urban. It has the same, if not more, inner pockets than the Urban which I like. So I decided to put it to the test. ...into the Route Slim Brief. I was able to strategically place everything into the Route including my 15" laptop. If you notice in the picture, I have a Samsung Galaxy Tab S3 which fits snugly into the side sleeve of the laptop section. I didn't have my Dell 15" in the picture, but rest assured, it fits into the Slim Brief like a glove. It was definitely meant for a 15.6" laptop (and yes, that's what they said it can carry). Speaking of gloves, I loved the idea of having the side-sleeve for a tablet. I'm also thrilled Solo understands that most developers carry more than one device at a time. So this side sleeve was a welcome surprise. Developers also have the gadgets and cables which is where the inner pockets come into play. 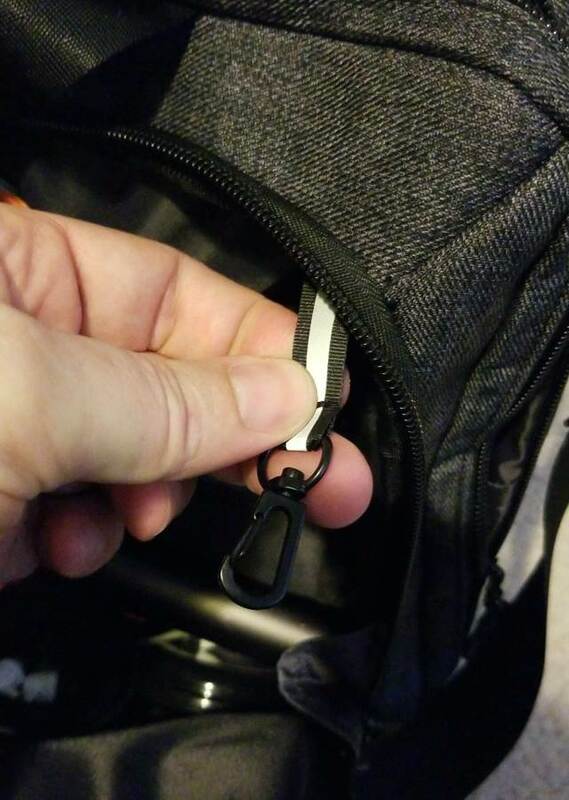 If you have keys or items you want to attach, there is a clip-on on the inside of the messenger bag which is what I was looking for on the Solo Urban Messenger Bag (the previous one). There are three primary pockets on the inside with two slim pockets on the front of each pocket. 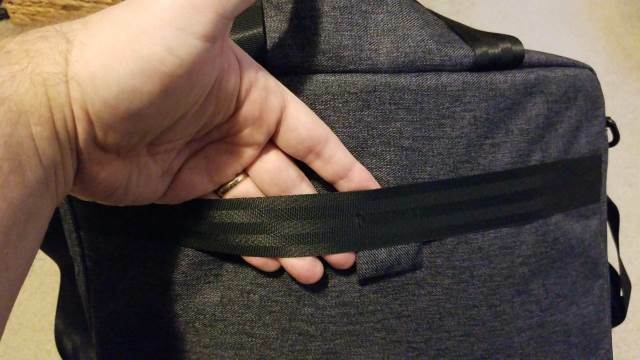 While it is nice to have slimmer pockets on the front of the primary pockets, placing items into the primary pocket puts a strain on items in the front. 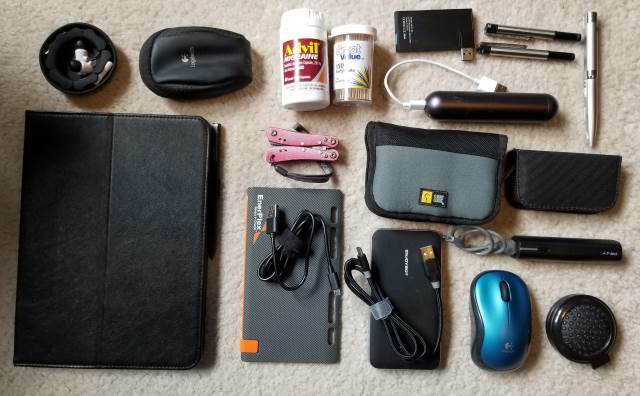 This would be mainly for credit cards and thinner materials, not computer mice or thick gadgets. The one thing I noticed was missing with the Solo Route was a back-pocket or front-pocket for papers, newspapers, or a magazine. The Urban (previous bag) had a zipper in the front for storing paper materials and I frequently used it when traveling. Even though the Route Slim Brief doesn't have a pocket in the front or back, it has a horizontal travel strap for luggage. With every Solo messenger bag I've seen, the back always has a strap to slide onto your luggage handle when extended. This keeps it on your luggage instead of throwing it over your shoulder. Speaking of throwing it over your shoulder, the strap was extremely long when it was extended to it's full length. I'm 6'4" so I thought I should extend the strap all the way. When I attached the strap to the bag and threw it over my shoulder, the messenger bag went down to my knees. After adjusting it to fit my size, I decided to try it out. The padding on the strap was comfortable on my shoulder. Then I noticed why it was comfortable. The entire strap reminded me of a seat belt. After closer examination, it looked like the same material as a seat belt. Well, at least I knew it wouldn't break. 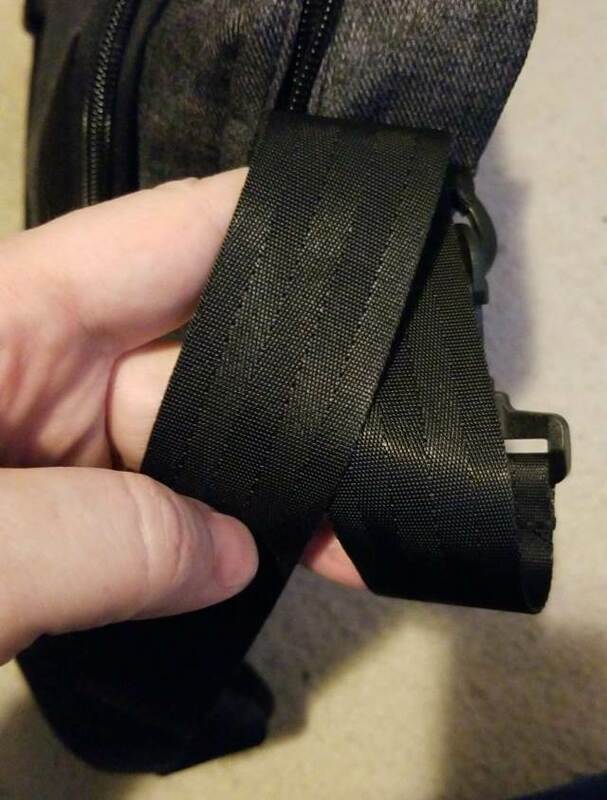 The material of the Solo Route is definitely higher quality and more durable (especially the strap). ;-) I feel this material could handle a lot of tugging and pulling without ripping. 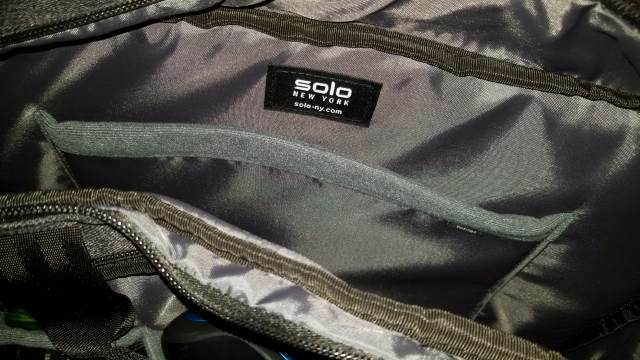 The Solo Route doesn't have a plastic feel to it, but more of a solid, woven cloth that won't rip easily. On top of that, they even have a 5-year limited warranty in case it does malfunction. The Solo Route Slim Brief is definitely better than the Urban I purchased the previous week. Even though there isn't a front or back pocket, I am definitely digging this messenger bag. As the name suggests, it's meant for digital nomads who need to carry enough to be productive, but it's slim enough to not weigh you down. 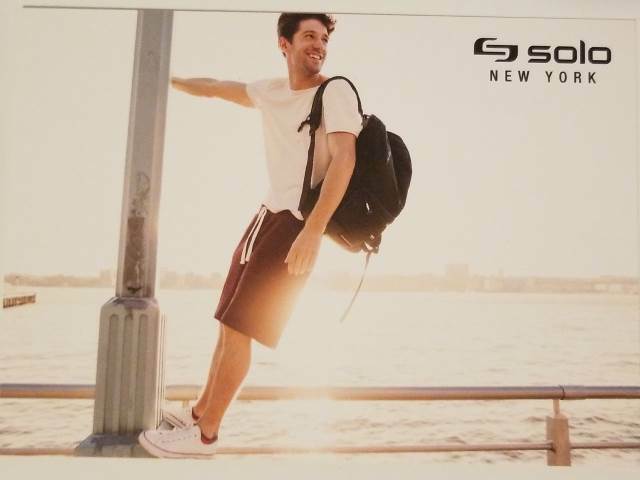 I want to personally thank Solo immensely for the opportunity to review their Route Slim Brief. This is an absolutely awesome messenger bag for the Nomad traveler. And what a coincidence. It's the name of their line of bags: The Nomad Collection. What type of messenger bag do you use? Do you use a backpack? (They DO have those as well). Post your comments below and let's discuss.